The next Bala product is in the making. The film Titled ‘Avan Ivan’ sees Arya and Vishal playing the lead roles. The female leads will be essayed by Janani Iyer and Madhu Shalini. Director Bala had earlier promised that this film would be different from his usual films and will have more comic elements. Arya and Vishal play siblings in the film and they have undergone complete makeover for this movie. ‘Avan Ivan’ is touted to catapult the lead stars’ career to newer heights. The music for ‘Avan Ivan’ has been handled by Yuvan Shankar Raja. 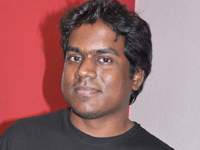 The director who usually signs music maestro Ilayaraja for his films has signed son Yuvan this time. Bala feels Yuvan will be able to bring the right feel to this youth-centric film. Reports suggest that the music album of ‘Avan Ivan’ will have four songs. The composer has completed two songs already. Sources suggest that Yuvan has mostly used raw Indian tunes in most of the recordings for this album. People close to the music composer have also promised that the music album for ‘Avan Ivan’ will be out soon. Director Bala who usually takes his own sweet time to perfect his film has completed this film sooner, compared to his previous films. Actor Suriya too appears in a cameo in ‘Avan Ivan’. It was director Bala who actually brought out the actor in Suriya with ‘Nandha’ which became Suriya’s launch pad to stardom in Tamil.